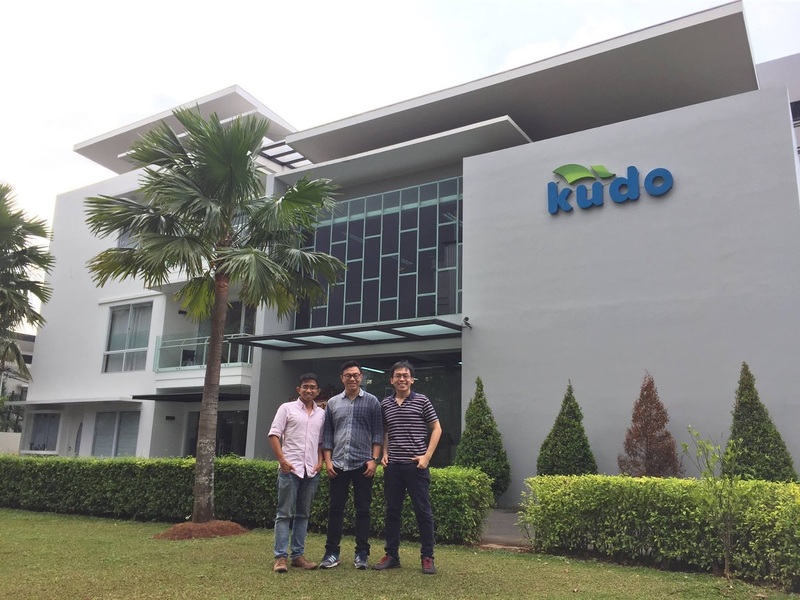 Kudo is an Indonesia-based tech company founded by local entrepreneurs Albert Lucius and Agung Nugroho in July 2014. The company wanted to allow anyone to participate in the local ecommerce scene, regardless of issues surrounding financial inclusion or internet access in the country. At that time, the nation’s unbanked population accounted for approximately 64% of all locals, while overall internet penetration sat at roughly 20%. Ecommerce represented only less than 1% of all retail transactions in the country. From 2004 to 2009, Kudo CEO Lucius attended the University of Illinois at Urbana-Champaign, where he received his bachelor's and master's degrees in computer science. After earning his MBA from London Business School and UC Berkeley's Haas School of Business, Lucius went on to become an analyst at Goldman Sachs, a product design engineer at Apple, and a consultant at Boston Consulting Group (BCG) before co-founding Kudo. On the other hand, Kudo COO Nugroho had experience in management consulting and a track record in the telecommunication, infrastructure, and public sectors. He held multiple associate and consulting roles at BCG between 2008 and 2011. He attended London Business School before becoming an MBA candidate at Haas School of Business. Willson Cuaca, co-founder of East Ventures, first met Lucius and Nugroho at a gathering of the Indonesian Professional Association (IPA) in Silicon Valley. The event was hosted in the cozy Bangkok Bay Thai Cuisine restaurant in Redwood City. Indonesian professionals in the South Bay area assembled to get a glimpse of the startup story back home. Lucius and Nugroho patiently waited until the event finished to talk about their startup with Cuaca privately. As the restaurant was about to close, the trio moved to a dark cafe across the street where Lucius and Nugroho showed the UI prototype using a tablet. The product instantly caught Cuaca’s attention as it seemed a very suitable product to serve ecommerce to the population outside of Jakarta, which was growing rapidly at that time. He quickly threw an offer. The three shook hands in the dark while the cafe was about to shut its doors. Lucius and Nugroho said that they took the money despite meeting Cuaca for the first time in under six hours. "At the end, it's about trust. I trust Willson," Lucius says. "You just need five minutes to determine if the person is trustworthy. Sometimes, it just clicks." Nugroho adds: "We know Willson before from his track record, but never met him. We knew he is a believer in people." The term sheet was sent to both co-founders the same night, while Cuaca traveled back to San Francisco to catch a morning flight to Singapore. The deal was finalized the following week and Kudo set up shop in Jakarta. "Finally, someone really understands the Indonesian opportunity of offline consumers, and combining that with tech is just powerful," Nugroho says. None of them could have known it at that time, but Cuaca’s quick-draw decision to invest in Kudo would turn out to be a key asset in ride-hailing behemoth Grab quest to win Southeast Asia. East Ventures came in as the first investor in Kudo’s seed round in June 2014 during the startup’s pre-product phase. It participated in multiple subsequent funding rounds before Kudo was ultimately acquired by Grab in April 2017. An early iteration of the company’s model involved kiosks that would be installed in public places. The idea was that consumers could approach these digital, self-serve kiosks and make ecommerce purchases from there. Later, Kudo decided to add human service representatives equipped with mobile devices to make it easier for less tech-savvy consumers. The tweak proved to be a success and catapulted the startup into the limelight as one of Indonesia’s leading online-to-offline (O2O) startups. Kudo is an interesting case study. While experts and entrepreneurs often cite Indonesia’s large population of more than 260 million as an attractive reason to start an e-shopping business in the archipelago, very few mentions that sluggish development in e-payments, logistics, and infrastructure mean that most of these consumers cannot be readily tapped. It’s true that the startup gives ecommerce access to those who would not otherwise have it, but it also offers a double advantage as it provides a livelihood for its agents. As the firm developed, Kudo began to tap all kinds of people to be its agents, including but not limited to convenience store operators and warung (Indonesian word for an open-air food stall) proprietors. These businesses exist everywhere, not just in the nation’s major cities. Kudo’s platform aggregates several local e-tailers in Indonesia, including Lazada Indonesia, Bukalapak, and Berrybenka. Its agents can sell everything from plane tickets to mobile vouchers and even help people settle their utility bills through the app. Regular people throughout the country who have Kudo’s online platform installed on their personal Android devices can also become agents. Indonesians who don’t have home internet connections, credit cards, formal bank accounts (or even a fundamental trust in ecommerce) may still shop online when they visit a Kudo agent. Unbanked shoppers also have the option to use cash to pay for goods purchased via a Kudo agent. In August 2016, Kudo became the largest assisted ecommerce platform for the working class and rural families in Indonesia. At that time, it revealed that its agents were able to earn an extra income of more than US$150 per month - a monumental impact for a country where the average monthly salary is less than US$300. The platform itself had been processing tens of thousands of transactions worth hundreds of thousands of dollars per day. A defining moment came in November 2016. Cuaca arranged for Kudo’s team to meet with a couple of East Ventures’ portfolio companies in Singapore, along with some other more established startups like Grab. Ming Maa, a longtime friend of East Ventures, had recently joined Grab and helped arrange a visit to the headquarters. Lucius and Nugroho, together with Kudo's engineering team, made the trip to Grab’s office - just for cross-learning. However, the meeting wound up in strategic discussions for both the product management and corporate finance teams, who would later ask Cuaca if Kudo was open to acquisition talks. The team was well prepared for fundraising but not for an acquisition. The opportunity was abundantly clear, staring everyone in the face, so Kudo needed to quickly get itself prepared. Looking back, it made perfect sense: Grab aimed for victory in Indonesia and acquiring a strong payments company would accelerate the journey. After an intensive merger and acquisition process during the year-end holiday, Grab acquired Kudo and made the official announcement in April 2017. Kudo’s acquisition was set to be the main strategy to expand GrabPay, the company’s digital payments ecosystem, in Indonesia. As for East Ventures, the cash exit returned two of the firm’s funds and it became one of Grab’s shareholders. Fast forward to today. Kudo now has more than 2 million agents and remains the archipelago’s number one agent-based O2O company. It is the first startup from Silicon Valley to successfully exit in Indonesia with a deal size of such magnitude. Kudo believes the milestone could potentially lead to more consolidation via M&A in the country. Kudo’s journey is without a doubt one the region’s most inspiring stories. It serves as living proof that persistent entrepreneurs can build multi-million dollar businesses in just 2.5 years’ time. Sometimes, all it takes is conviction from investors from day one, even when the company itself is still just a vision. This original content is part of our series revealing the behind-the-scenes stories of how East Ventures invested in Southeast Asia's leading startups.